Update Jul 26, 2016: The full patch notes have now been released, so make yourself a brew and pull up a seat – it’s a biggie. In a game about huge, epic battles waged in wars between entire races, the latest Total War: Warhammer patch is definitely appropriate. It’s an absolute beast. For more moving tiny men around the battlefield, we’ve gathered the best strategy games ever. From fixing bugs that stopped enemies appearing until they’re 10m away to high resolution UI sliders, there’s a bit of everything in here. There are new features, improved campaign AI, reworked factions, countless bug fixes and performance improvements. I would list them all here, but I fear the heat of the sun will take me before I’m done. You can read the fullTotal War: Warhammer – Update 2 patch notes at that there link. See you in an hour. Update Jul 26, 2016:Creative Assembly have revealed the extent of the free content patch coming with the DLC – there’s quite a bit of it. 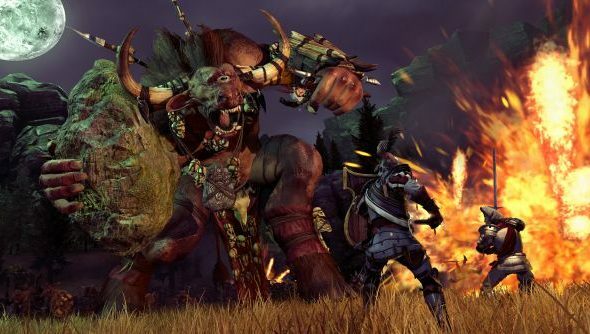 Along with the Beastmen DLC due to be released into Total War: Warhammer on Thursday comes a free patch. The full details of what is contained in that have now been released – and it’s significant. A new hero and mount – this is the Amber Wizard with his new school of beast magic, riding a giant griffon. An entirely new AI-controlled Race as opposition – this adds the Beastmen as encounterable enemies, even if you don’t own the DLC. New multiplayer features – players are now able to customise lords and heroes using a point-buying system where each bit of equipment is worth something. New multiplayer and custom maps – Stir River, Grimminhagen, Fall of Man and Kelp & Koldust. Unlockable Lord for MP/Custom battles -Sarthorael the Everwatcher, a Lord of Change Greater Demon of Tzeentch. You have to unlock him by playing the campaign. There’ll be full details of balance tweaks and other bits in the patch notes released shortly, but for now you can read the full details of the above over on the wiki. Original story Jul 14, 2016:It hasn’t taken long for Total War: Warhammer to start expanding. After some big patches and free DLC, it’s now releasing its first major race expansion with the Beastmen. They’re a full additional faction for the campaign map, operating a horde-style fashion similar to Chaos. On top of being playable in all the normal modes, they’re also getting their own unique story campaign called An Eye For An Eye. It may not come as a surprise, but lots and lots of ‘man-filth’ are going to meet their end. As for how they’ll play, they have their own form of magic which involves “twisted acts of faith” to their deity, Morrsleib, the Chaos Moon, for devastating effect. They also wield the Lore of the Wild and, naturally, have their own unique set of units, from line troops to massive hulking beasts. On the campaign map they have their own version of the Deep Roads called Beastpaths. It’s launching on July 28, but you can pre-order it now via the Steam page, once it’s live. It’ll have a 10% pre-order bonus too. The official announcement’s up on Steam if you want all the details. It will come with a free content pack that includes a new Lore of Magic for smashing enemies to sparkly bits, and a new hero to wield it for The Empire. Amber Wizards, wielding the Lore of Beasts, are capable of summoning manticores once they’ve powered up.